Organization goes hand in hand with decluttering and cleaning. Organization can also go a long way when it comes to helping with time management skills. But, sometimes getting started with organization can be overwhelming. We may have put it off for whatever reason or another. Or we just don’t realize that it’s easy to get started. 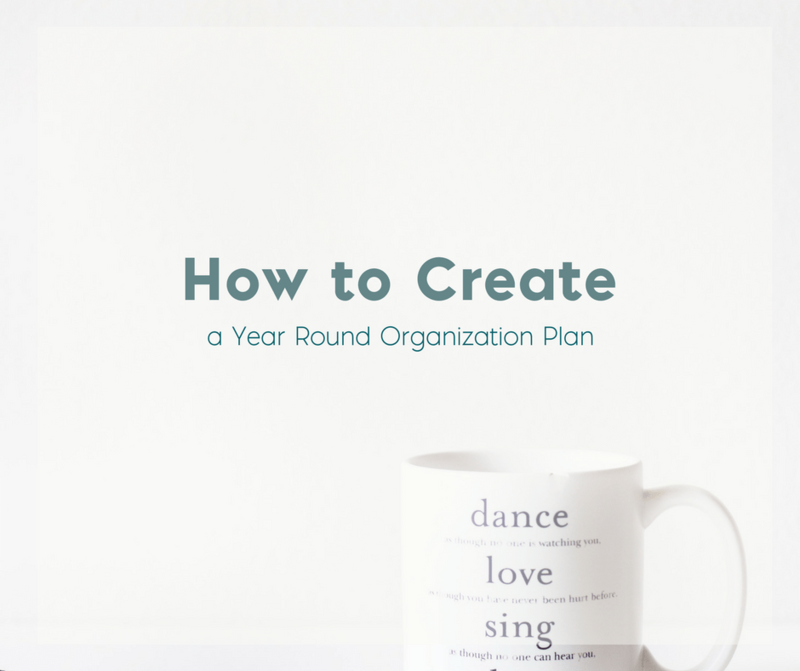 If you’re looking to get organized, I want to share a few tips on how to create a year round organization plan. Sometimes organizing your home feels too overwhelming. The closets are jam packed. There’s no room in the garage for another box. And the clutter just keeps piling up. Step back from the chaos and create a plan. Most plans are effective when they feel like they’re achievable. That means breaking a large scale project or goal up into smaller, bite size, pieces. 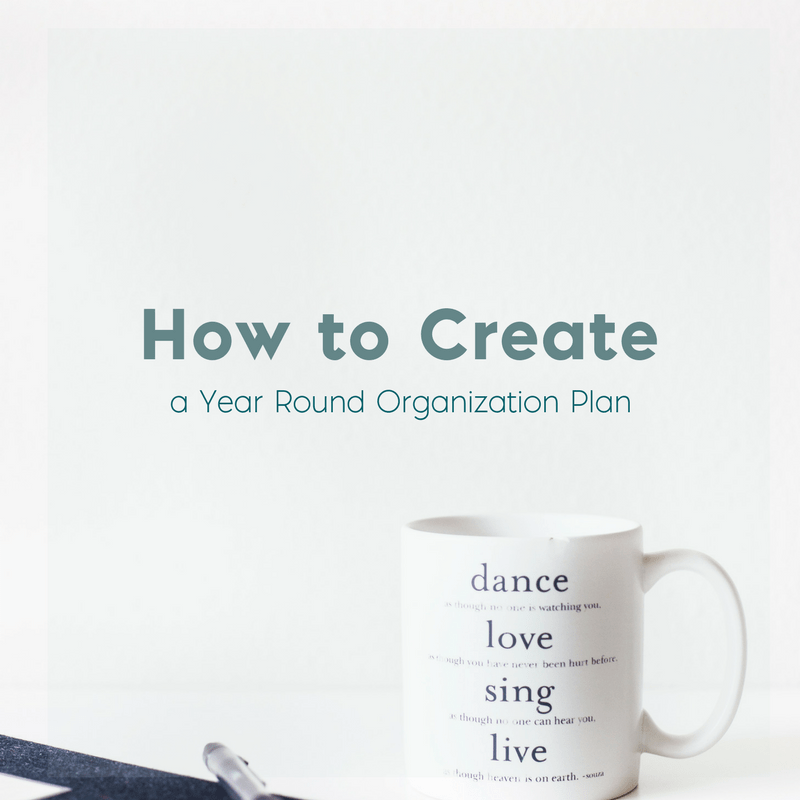 This twelve month organizing plan can help you have a completely organized home in a year. Of course, if you’re feeling motivated you can push through the plan as fast as you’re able to. Why start with the bedroom? Well, often the bedroom is the most personal room in your home. It’s where you spend a significant portion of your life. It’s also where you reconnect with your significant other. But perhaps most importantly, organizing your bedroom is a manageable way to start your year of organizing. Divide your bedroom belongings into three main piles – keep, donate, toss. If you cannot manage your entire bedroom in one day or weekend then break it down by space. For example, each day clean out the closet, dresser, under the bed and so on. It’s amazing what collects in medicine cabinets and under the bathroom sink. Grab a garbage can and throw the junk out. Reorganize what you keep by using labels and storage containers. The kitchen can be a big job. Often there are a lot of extra dishes and small appliances. For example, you might have two blenders. Repeat the keep, donate, toss process this month in your kitchen. 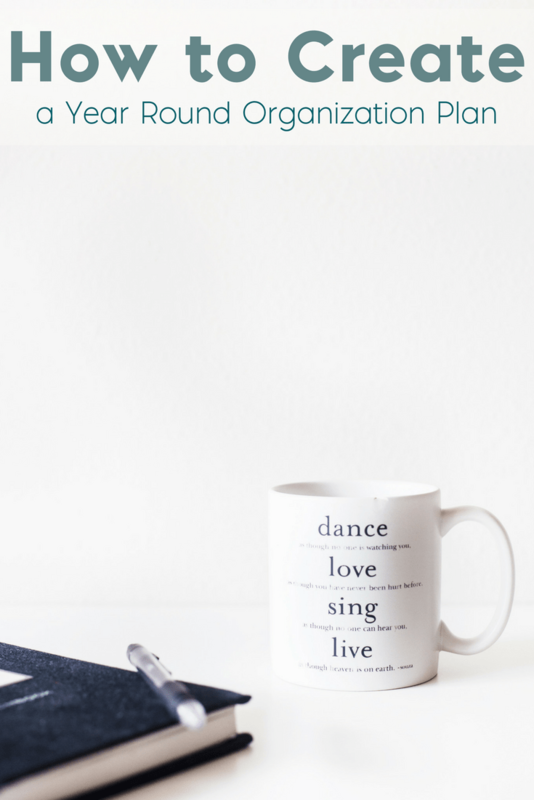 Reorganize and remember there must be a space for everything you keep. Month Four: Take it off and reassess your organizing systems in your bedroom, bathroom and kitchen. Fix what isn’t working. Month Five: Guest Bedroom/Home Office. Get them involved in the keep, donate, toss process. If you’re willing, consider holding a garage sale. Children’s items sell quickly and your children might be motivated by the money they can earn by getting rid of some of their stuff. Month Eight: Take this month off. If you haven’t held the garage sale yet then now is the time. Additionally, evaluate the organizing systems you created in your guest bedroom or home office and your children’s rooms. Fix anything that isn’t working. Honestly the garage is usually the worst place in most people’s homes. They like to shove things in there and forget about them. You may need to focus on your garage the entire month using all your weekends to get the job done. Month Eleven: Dining Room and any extra rooms you’ve missed. Month Twelve: Basement and/or Attic. With each room try to keep the three tier system in mind when returning items into the space. Your keep items need to have a proper place to be appreciated and used. In most cases one weekend a month is all it takes to overhaul the room. Over the course of a year you’ll transform your entire home into an efficiently organized and clutter free space.